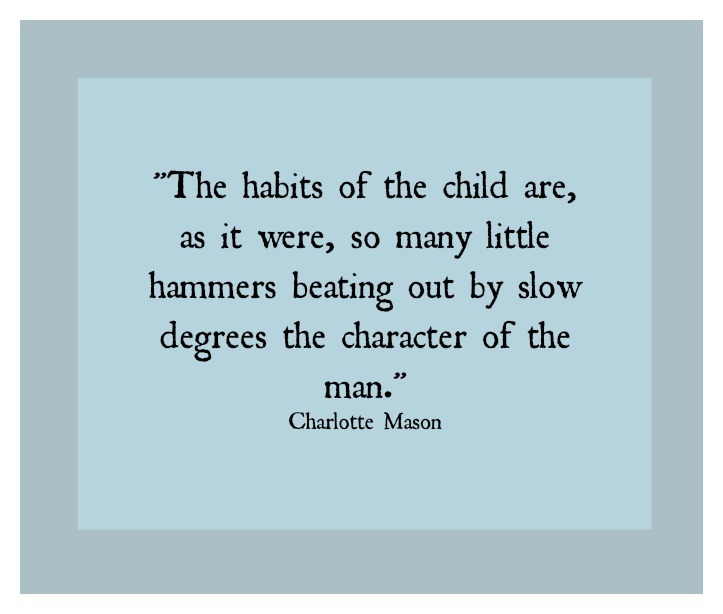 When I first heard the term ‘habit training’ as I was exploring the Charlotte Mason method of education, I thought to myself, “Hmmm. That’s an interesting way to put it.” I already knew the importance of child training — that a child left to himself is a disgrace. (Proverbs 29:15 NIV) I had just never thought of it as habit training. Habits are inevitable. 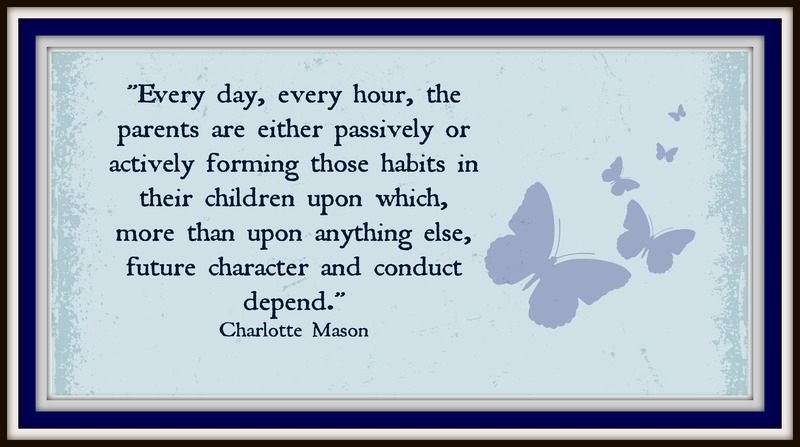 We really are creatures of habit. 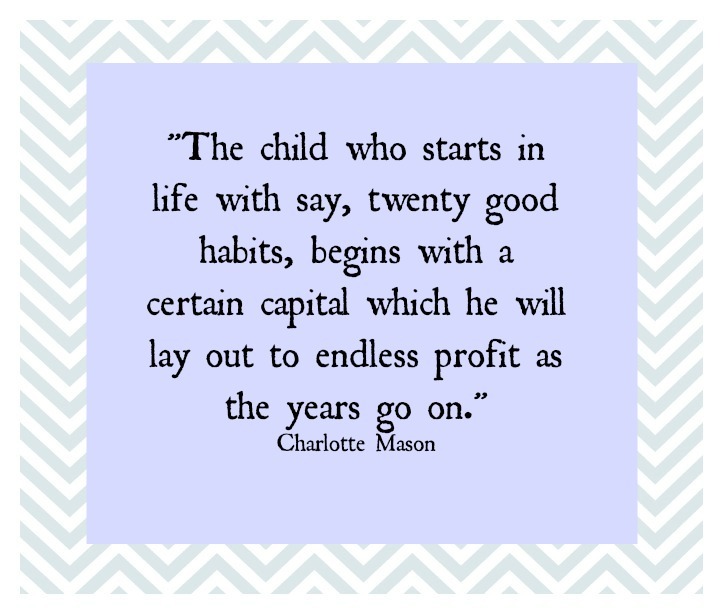 The question is not whether we are forming habits, but rather what kind of habits. Without trying, we easily slip into the behavior and thought patterns that come most naturally to us. As we do them more and more, they become a well-worn path in our minds, and we behave and think in those ways subconsciously. All this is a good thing to a certain degree. If we had to stop and deliberate about every little thing we did each day, we would be worn out and frazzled with all the decision making. Which hand should I use to pick up my fork? Shall I put my left or right foot first as I’m going down the stairs. Can you imagine?! The point is, habits are very powerful. They move us into a certain action without taking time to deliberate. To be able to always choose the right course of action in mental and moral matters simply because we have been trained to do so — that is the beauty of habit when used to our benefit. When we have as our goal training our children in habits which will produce good and godly character in them, and when we believe such training is one of the greatest gifts we can give them — an investment in their future as servants of God and fellow man — then we will be motivated to work diligently toward that end. I don’t know about you, but that’s what I want for my children! One of the aspects of habit training that grabbed my attention first as I began to look into it, was that “the mother devotes herself to the formation of one habit at a time, doing no more than keep watch over those already formed.” You’ve probably heard it said, that it takes 40 days to form a new habit. Well, the idea here is to concentrate for 6-8 weeks on a particular habit. Once that one has been mastered, or at least fully understood and regularly practiced, then a new habit is introduced and worked on. The number one thing to keep in mind at all times is to consistently deal with the lapse of the particular habit being worked on the first time, and every time. To do this, we as parents have to be alert and watchful. My automatic response so often tends to be reminding and nagging, saying it one more time. It takes much more effort to remember the pre-determined plan of action and implement it right away — the first time. Somehow, my mind gets foggy as to what it was exactly that I had planned to do when someone forgets the new habit and slips right back into the old. It is because of my tendency to lose my focus, that I decided to use a systematic approach, a carefully prepared program that would help me plan and think clearly about my goals for habit training, and the method for making it happen. 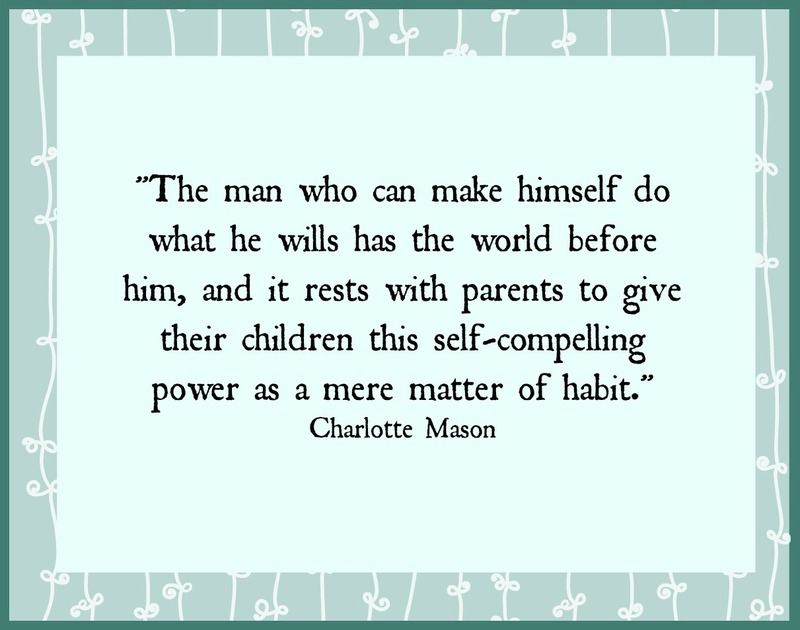 I purchased the book Laying Down the Rails from Simply Charlotte Mason, along with the accompanying workbook set, Laying Down the Rails for Children. Each of these categories are further broken down into specific habits to be worked on one at a time — habits such as: obedience, attention, truthfulness, neatness, manners, personal initiative, self-control, fortitude, and thanksgiving, just to name a few. No, we won’t be able to address every one of them individually for 6 – 8 weeks at a time, but we can begin with the ones we know our children need the most help with first, and then take it one step (or habit) at a time, seeking God’s guidance for what he would have us do. I’ve decided to begin using this systematic approach to habit training over the summer. I sit down with the kids once a week and go over a lesson, reading the stories, letting them take turns reading the Bible passages aloud, and discussing with them how we’ll work on a particular habit for the week. I hope to share some of that “how” in a future post. This one is long enough! Oooh. Great resource, thanks for posting. I’ll be looking forward to hearing about the “how.” We did a two week unit this spring when I basically set aside the “academics” in favor of the behavioral. It took about five weeks, but I finally saw some progress on the one behavior I was specifically looking to address (obedience), but it isn’t perfect. I want to focus on sibling fights next, but so overwhelmed with that one! Maybe I need a system too!! What a great confirmation of what I always suspected! I would be interested to know what appropriate consequences you use. I find that sometimes we are having so many negative consequences, that our home is full of punishment, and the sassiness doesn’t just vaporize. When they were younger, a little punishment would quickly turn their behavior around, but not any more. Finding and implementing appropriate consequences is a tough one for me, too. I’m not sure what ages your kids are; mine range in age from 3 – 13. The first habit we’re working on is obedience. For some of them it’s a review, for others there’s more of a need for remedial work. Most of the problems arise when they argue, whine, or pitch a fit about something I’ve asked them to do, as in a job or a chore, and sometimes I’m dealing with delayed obedience, which I believe is still disobedience. I believe it’s best to make the consequences match the behavior, so for instance, when they whine about what I’ve asked them to do, they get another job. What I’m hoping to train them in is to participate willingly in our family’s work, and to serve cheerfully. If they can’t do that the first time they’re asked, they get another opportunity to practice. I remember an experienced Mom telling me once that if her kids couldn’t get along with their siblings, they weren’t allowed to play with friends/neighbors for a day; they needed to practice brotherly love at home first. by Tedd Tripp. (Link included below) He is careful to warn parents not to focus on behavior at the expense of true heart change. Especially as kids approach the teenage years, we need to be careful that our interactions with them aren’t primarily a list of dos and don’ts or a litany of commands. If respect seems to be a difficult issue to master, I believe I would talk to my kids during a non-confrontational moment, either individually or as a group, depending on the nature of the issue, and appeal to their conscience. Do they really think they are being respectful? What do they think God requires of them? Do they want to have that kind of relationship with their adult friends some day, or their employer, etc.? Share your heart, letting them know you’re on their side, and letting them know you want to enlist their help to come up with ways to tackle this problem together. As an adult, disrespect for those in authority will earn them consequences, most likely in the form of loss of priveleges. I think I would start there — taking away computer time, TV time, or other free time. They need to learn that respect usually results in promotion and greater privileges and disrespect incurs the opposite. And finally, I believe the single most effective tool we have as mothers when it comes to training our kids in good habits is the ability to calmly but firmly call them out when they are in error —promptly — the first time, and give them negative consequences that are strong enough to get their attention right then and there, or at least tell them right then what they have to do as a result of their behavior/attitude. I really do find it so difficult not to get annoyed, and to nag, and to fuss. But I also really do not want to become “Fussy Mommy” whom they have learned to tune out because I’m always harping about something. This is probably way more than you asked for! If so, I apologize. Blessings on your journey!